Quick! Someone Common Core this for me! Have you ever heard the one-liner, “Over 78% of statistics are made up on the spot”? Well, that joke has now made it to the White House — and the president loves to tell variations of it at his press conferences. 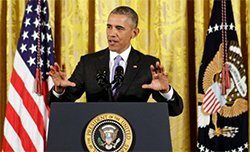 Most recently, the president claimed that “99% of the world community” thinks his Iran “deal” (read: “disaster”) is a great idea that will do exactly what we know it won’t (i.e., keep the “Death to America/Death to Israel”-chanting Iranians from building nukes with which to make good on those chants). So if 99% of the world community loves Obama’s plan, then that one percent that doesn’t love it must include the 71% of respondents to a March NBC/Wall Street Journal poll and 64% from an end-of-June CNN/ORC poll who believe that the president’s deal would not keep Iran from producing nuclear weapons. And it must also include Israel. And it must also include the entirety of the Middle East which, according to U.S. officials and experts — who obviously weren’t included in Obama’s “majority of nuclear experts” — will likely initiate “a wave of nuclear research and threatening rhetoric that will make the region even more of a tinderbox than it is now.” Kind of a sizable one percent, don’t you think? And as for an alternative? As they said over at the Gateway Pundit, “As if [Obama] would listen to an opponent’s alternative. Get real.” But let’s start with this old, tried-and-true principle: “Don’t negotiate with terrorists.” Peace through strength and resolve. Follow that simple idea, and America and Israel wouldn’t now be in the crosshairs of a lunatic government, and the rest of the Middle East wouldn’t be scrambling for defensive measures. “Today, the average full-time working woman earns just 77 cents for every dollar a man earns.” — President Obama in remarks on equal pay for equal work, April 8, 2014. Then, of course, there’s the politically motivated move to make community college “free.” Granted, the taxpayers would be on the hook for roughly $80 billion over the next 10 years, but who’s counting? Well, frankly, those of us who are paying for it. But I wonder if the kids who are cheering for those four years of free tuition have done the simple math and figured out that 10 – 4 = 6. And I wonder if they realize that, under that plan, they might not pay for four years of community college, but they’ll be on the hook with the rest of us for that last six years?